Are you ready to do a ride and camping trip in the Texas Hill Country during wildflower season? Tour the Texas Hill Country with us (at your own risk) on a self – supported bicycle tour. If we get 30 or more interested parties we will plan a sag or maybe even entertainment. So far there is no charge, as in free as a bird! See the full 405 mile route here or scroll down for segments. Google Maps would not give a short URL for the complete route. So I will update and add the segments below. – Route has been pre-verified. Simply pay your costs for campground entrance fee (about $5 per night or so) and be ready to roll at 8:00 a.m. daily. We may change a couple of overnight locations adding a B&B or motel in kerrville / Ingram and Comfort so please bookmark this page, follow for updates. Entertainment options will be listed as well. – Contact and signup form to be linked here. Inks Lake State Park just West of the town of Burnet, TX. approximately 55 miles. No big climbs. Day Two: Inks Lake State Park to Enchanted Rock State Park, approximately 51 miles. Your happy self with a touring bicycle, bright smile and outer layers up top (ok layers optional), camping gear as light as possible (they don’t call it Texas Hill Country for nothing). We can pick you up at the airport in Austin or you can take public transportation most hours during the week to the Lakeline Transit Station nearby (see http://www.capmetro.org). There’s lots to do in Austin too! More links to come so watch for updates. Please feel free to contact me or share this blog. How about a week long loop with a low day of 50 miles and a high of 70 miles depending on the terrain? Camping in parks with showers or in private homes would be nice, but wild camping would be ok too. I agree! Am looking at state maps and Adventure Cycling Association map for the area. From experience, the first day riding to Inks Lake State Park from NW Austin at 60 miles is a comfortable ride mostly along back country roads, as the climbs are not steep and it ends in a beautiful, long downhill into the Colorado River Basin after a nice late lunch in the town of Burnet. From Inks Lake, I envision a ride down river on Park Road. 4 to FM (Farm – Market) 2342 where we will turn right on to FM 1431 and cross the Colorado River at Kingsland, TX. 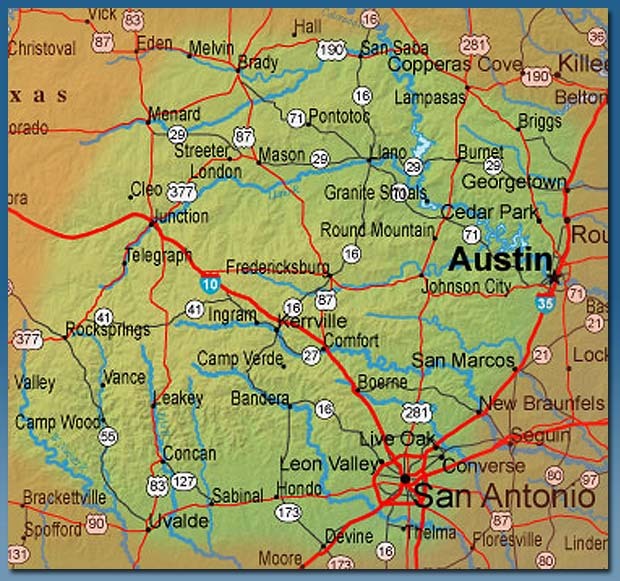 (See: http://goo.gl/maps/HJvA6 ) to follow back-country roads a total of 51 miles to Enchanted Rock State Park. The rest of the trip is still in planning stages. Web site says drought has affected potable water supply. Before leaving on the ride make a note to make reservations and to ask about water supplies. There are showers. 1. Inks Lake SP – 50.6 mi. 2. Enchanted Rock Natural Area – 48.7 mi. 3. Pedermales Falls SP – 54.2 mi. 4. Guadalupe River SP – 54.0 mi. 5. Kerrville-Schreiner SP – 50.3 mi. 6. LBJ SP – 44.5 mi. 7. Avery Club Drive, Austin, TX end day 7 – 81.6 mi. Or, End the group ride someplace down town Austin for a drink and farewells. Don’t forget your camera. It’s wildflower season, and the bluebonnets ought to be amazing.